There are many educational uses for 3D printing. Britain is considering adding 3D printing as a course requirement for their K-12 schools. Engineering students are able to 3D print their designs to see how they work. Doctors are able to 3D print a replica of a patient’s heart to learn more about the problems with the heart and how best to perform the needed surgery. Here at WhiteClouds, we are busy designing and 3D printing electron microscopic creatures so that you can see these tiny life forms up close. The bugs are wonderful ways for both adults and children to learn about and understand the fascinating world of microscopic bugs. You can look, touch, and understand a bug without having live creepy-crawlers in your living room (bringing a whole new meaning to “living” room”). Although in reality, these bugs are everywhere, you just can’t see them. What kind of bugs are you working on? I am working on a Water Mite. What is the scariest microscopic bug you’ve encountered? Hmm. 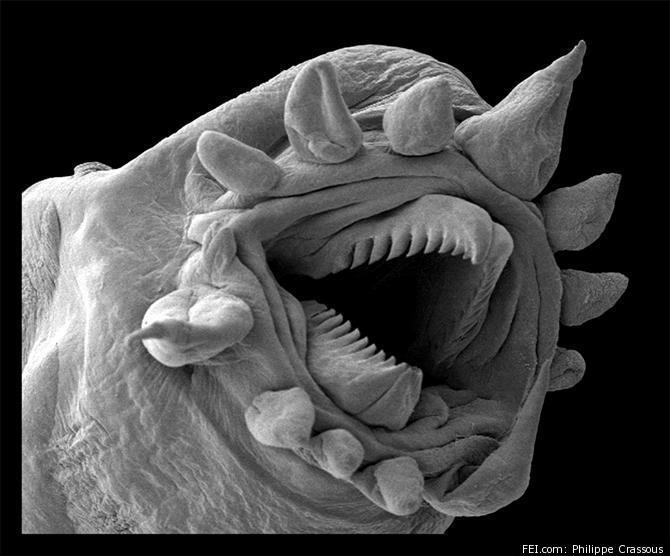 The scariest microscopic organism I’ve encountered is probably the Hydrothermal Worm. Something about it just creeps me out. What are some things we can learn by studying these creatures? These creatures are what make up the world around us. Just because we don’t notice them all the time doesn’t mean they don’t have a profound impact on the earth as a whole. We are just scratching the surface of what really surrounds us. Do you feel that these bugs are the stuff of nightmares or are they fascinating (or both)? I think that these bugs are really fascinating. Very interesting creatures some in all shapes and sizes. These ones just happen to be incredibly small. What do you like best working with these bugs? Having the opportunity to work on projects that haven’t really been done, with creatures that most people don’t even know exist is kind of exciting. I certainly don’t feel that I have a ‘normal’ job, and I love it. For this particular project, much of the inspiration began with a Google search, to be honest. I found the images of the creature I was looking for and then followed the links to the originating pages to see what else I could find so I could learn more about what I was working with. These designs are not like anything I have ever seen before. The closest similar project has been of other bugs or insects, but they were creatures you might recognize having seen yourself, nothing on the scale requiring an electron microscope to see. I feel that these designs will help people get a more complete view of the creature as they study it, either for scientific research, or perhaps simply for an elementary education. To be able to see a picture is great, but to actually be able to hold a model in your hand, forgive the pun, adds another dimension. The software I am using primarily consists of Autodesk 3ds Max, with heavy support from Adobe Photoshop. When this project is printed it will likely be done with the ZPrinter 650. Well, the process begins with me taking some time to learn about the project. Pictures are always helpful, but also written articles are very useful in really understanding what I am working with. Once I can really visualize what I will be modeling, I start mapping out the project mentally, taking into account the scope of the project, any predicable limitations, as well as the projected budget, in materials, and especially time. Once I have a fairly good idea of where I am going, and where to begin, I import whatever pictures or references I have into 3ds Max and start working with objects. I begin by getting things in the rough position and size of the final product, then I work on refining each section, isolating it from the rest, and using all of the reference material I have to make each part as accurate as possible. Once that process is complete and I am satisfied with the model itself and the colors and textures on the surface, I take all of the individual objects and weld them all together into one single, printable object, then export the file to the printing software. I always have a tendency to look for the flaws in my work so I can improve myself and always have my next piece of work be better than my last one. For each project, I try to get as much feedback as possible so that any changes that need to be made can be fixed before the final version is released. To date, my involvement in post-production has been largely limited to observation. I’m positive that will be changing soon. The most common problem I encountered on this project was in defining the details. Drawing the line of what details were to be included, which were not, and which ones had to change was consistently difficult. On these tiny creatures there are so many exceptionally fine details that it would take hundreds of hours to really get them all in the model, and if you did, you would run into two more problems: First, a file that was so huge would be unmanageable, and second, most of the details would either be lost in the print, or so fragile that they would be broken under their own weight. I absolutely love my work. It really is both creative and technical. I am always working on something new and likely something that has never been done before. Plus, when I am finished, I actually get to see what I worked on for so long be printed out and share it with everybody. It is really cool to be working in such an exciting industry. Ah, to the home users I say: “Don’t give up!” Be careful with trying to get too much detail in the project, and allow yourself a little creativity. Not everything will be fully dictated to you on how it should appear, either in the model itself or the colors. Let your knowledge and imagination fill in the gaps as needed. Also, remember that pictures from electron microscopes contain no color. Any color included in the picture is either put there with feature detection software from the microscope or simply hand-edited afterwards, so don’t let the pictures you see determine what colors you use. If Plan “A” doesn’t work, keep calm. There are plenty more letters in the alphabet.